While a Warlock invokes his fey or fiendish heritage, and the Dragonfire Adept calls upon the power of the great Dragons, the Invoker merely calls upon the flows of Arcana themselves. In this way, he is the closest to an actual spellcaster of the three, and knows a great many more Invocations than they do. Invokers are generally studious; anyone who might be a Wizard could be an Invoker instead, if they wished. There are substantial differences between the power of the two, however, so the way of the Invoker will appeal to those who prefer to never be without the magic they need. Invokers are also more worldly than their book-delving brethren, and many an Invoker eschews the more academic arcane arts precisely because they spend more of their time walking the real world. Intelligence is the most important Ability for an Invoker, as it determines the strength of their Invocations. However, Wise Invokers are quite common, as their skills often favor Wisdom. And of course, no adventurer should be without a reasonable Constitution. Invokers come in all alignments, and in no particular preference. Like Wizards, their rational approach to magic can appeal to the Lawfully inclined, but unlike those they are also very adaptable and very dependable, which appeals to the Chaotic wanderer. There is power enough to appeal to both Good and Evil, of course. Interestingly, Half-Elven Invokers seem especially common, though this is largely due to temperament and less to natural ability: those Half-Elves who favor their Elven heritage take an interest in magic, but often lack access to Wizardly universities, and therefore often find Invoking more appealing. Of course, any race that is naturally Intelligent will have an advantage as an Invoker, and Humans can be found as Invokers much like they can be found doing anything else. Skill Points at First Level: (4 + Intelligence modifier) x4. Skill Points per Level Thereafter: 4 + Intelligence modifier. Class Skills: Appraise (Int), Autohypnosis (Wis), Concentration (Con), Craft (Int), Decipher Script (Int), Forgery (Int), Heal (Wis), Knowledge (all skills taken individually) (Int), Listen (Wis), Perform (Cha), Profession (Wis), Search (Int), Sense Motive (Wis), Speak Language (N/A), Spellcraft (Int), Spot (Wis), and Survival (Wis). An Invoker is proficient in all simple weapons, but in no forms of armor or shields. Armor of any form may interfere with his Invocations that have Somatic components (most do). An Invoker’s Invocations are spell-like abilities; using an Invocation is therefore a standard action that provokes attacks of opportunity. An Invocation can be disrupted, just as a spell can be ruined during casting. An Invoker is entitled to a Concentration check to successfully use an Invocation if he is hit by an attack while invoking, just as a spellcaster would be. An Invoker can choose to use an Invocation defensively, by making a successful Concentration check, to avoid provoking attacks of opportunity. An Invoker’s Invocations are subject to spell resistance unless an Invocation’s description specifically states otherwise. An Invoker’s Caster Level with his Invocations is equal to his Invoker level. The save DC for an Invocation (if it allows a save) is 10 + equivalent spell level + the Invoker’s Intelligence modifier. Since spell-like abilities are not actually spells, an Invoker cannot benefit from the Spell Focus feat. He can, however, benefit from the Ability Focus feat (see page 303 of the Monster Manual), as well as from feats that emulate metamagic effects for spell-like abilities, such as Quicken Spell-Like Ability and Empower Spell-Like Ability (see pages 303 and 304 of the Monster Manual). The four grades of Invocations, in order of their relative power, are Least, Lesser, Greater, and Greatest. An Invoker begins with knowledge of two Least Invocations, plus Magic Insight, a third Least Invocation (see below). As an Invoker gains levels, he learns new Invocations, as summarized on Table 1. A list of available Invocations can be found following this class description. At any level when an Invoker learns a new Invocation, he can also replace any one Invocation he already knows with another Invocation of the same or a lower grade. Finally, unlike other spell-like abilities, Invocations are subject to Arcane Spell Failure chance from worn armor. Invokers can qualify for some Prestige Classes usually intended for spellcasters; Invokers benefit in a specific way from Prestige Classes that have “+1 level of existing arcane spellcasting class” or “+1 level of existing spellcasting class” as a level advancement benefit. An Invoker taking levels in such a Prestige Class does not gain any of his class abilities, but he does gain an increased Caster Level when using his Invocations. An Invoker also gains new Invocations Known at these Prestige Class levels as though he had gained a level in the Invoker class. An Invoker can qualify for Prestige Classes with spellcasting level requirements, even though he never actually learns to cast spells. To do so, he must have a Caster Level equal to twice the Spell Level required. At 1st level, the Invoker gains Magic Insight as a bonus Invocation known, regardless of his other choices of Invocation. As the Sorcerer or Wizard class feature. An Invoker may use the Share Spells feature to share Invocations with his Familiar, even though they are not technically spells. He does not gain the ability to share other types of Spell-like Ability. At 2nd level, an Invoker gains Brew Potion as a bonus feat, and furthermore can create any potion without being able to cast the spell it requires by having a Caster Level of at least twice the Spell's level, and succeeding on a Craft (Alchemy) check equal to 10 + the Spell's level. Success means that the Invoker is treated as if he had successfully cast the spell; the Invoker still must provide all other resources for the brewing. An Invoker with the Alchemist feature may also brew Spellvials, special potions which are used as thrown weapons. Spellvials are brewed using spells of no higher than 3rd level, just like potions, and the spells must furthermore function either on a ranged touch attack, a single specific target, or in an area that may be placed at range (not an area that must be centered on the caster). Throwing and hitting with a spellvial is ranged touch attack: for single-target spells, this means the spell hits (and in the case of spells that offered a Reflex save, they automatically fail this save since the Invoker has actually hit them with the attack), for area-effect spells it means the spell is essentially cast centered on the area where it was thrown (and any targets within the area are allowed any applicable saving throws, including Reflex saves). As weapons, spellvials have a range increment of 10 ft. Ingesting a spellvial has no effect. At 4th level, an Invoker gains Scribe Scroll as a bonus feat, and furthermore can create any scroll without being able to cast the spell in question by having a Caster Level of at least twice the Spell's level, and succeeding on a Forgery check equal to 10 + the Spell's desired Caster Level. Success means the Invoker is treated as having successfully cast the spell; the Invoker must still provide all other resources for the scribing. The Invoker may also substitute a Forgery check for his Use Magic Device check to attempt to activate scrolls. A 6th level Invoker brews potions, spellvials, and other alchemical items far more quickly than others: he makes as much progress on alchemical items in an hour as others do in a day, and as much progress in a day as others do in a week. He may also brew two potions or spellvials in a single day, as opposed to only one. A number of times per day equal to the sum of his Intelligence and Wisdom modifiers, an 8th level Invoker may cast a spell from a scroll without consuming the scroll. In order to do so, he must have a number of ranks in Forgery equal to the Caster Level + the Spell Level of the scroll, and he may only cast a spell from any single scroll once per day without consuming it. At 10th level, an Invoker gets even better at brewing potions and spellvials: He may brew three in a day instead of two. He also gains a 25% discount on the gp and XP costs of brewing potions, spellvials, and alchemical items. Beginning at 12th level, an Invoker may begin to brew potions and spellvials that use spells of up to 4th level. At 14th this goes up to 5th level spells, at 16th, 6th, at 18th, 7th, and at 20th, all the way up to 9th level spells may be added to potions or spellvials. 1 Originally printed as a Warlock Invocation in Complete Arcane. 2 Originally printed as a Warlock Invocation in Complete Mage. 3 Originally printed as a Warlock Invocation in Dragon Magic. 4 Originally printed as a Dragonfire Adept Invocation in Dragon Magic. N New Invocation described below. All-Seeing Eyes2 - As Comprehend Languages on written material, plus bonus on Search and Spot checks. Aquatic Adaptation4 - Breathe underwater; gain swim speed. Arcane Knowledge4 (as Draconic Knowledge) - Gain bonus on Knowledge and Spellcraft checks. Baleful Utterance1 - Speak a word and shatter objects as the Shatter spell. Beguiling Influence1, 4 - Gain bonus on Bluff, Diplomacy, and Intimidate checks. Body AugmentationN - Use Bear's Endurance, Bull's Strength, or Cat's Grace, as the spells. Breath of the Night1, 4 - Create a fog cloud as the spell. Call of the Beast2 - Speak with animals and influence their behavior. Darkness1, 4 - Use Darkness as the spell. Deafening Blast4 (as Deafening Roar) - Cone of sound deafens creatures. Earthen Grasp1 - Use Earthen Grasp as the spell. Ebon Eyes1 (as Devil's Sight) - See normally in darkness and magical darkness. Elemental AnimationN - Use Animate Fire, Animate Water, or Animate Wood, as the spells. Endure Exposure4 - Use Endure Elements as the spell; target gains immunity to your Invocations that deal damage of one energy type. Entropic Warding1 - Deflect incoming ranged attacks, leave no trail, and prevent being tracked by scent. Leaps and Bounds1 - Gain bonus on Balance, Jump, and Tumble checks. Local TremorN - Use Local Tremor, as the spell. LorecallN - Use Balancing Lorecall or Listening Lorecall, as the spells. Magic CoatingN - Use Grease or Sticky Floor, as the spells. Magic Insight4 - Detect magical auras; identify magic items. Make Your Own Luck1 (as Dark One's Own Luck) - Gain a luck bonus on one type of saves. Miasmic Cloud1 - Create a cloud of mist that grants concealment and fatigues those who enter. Mind AugmentationN - Use Eagle's Splendor, Fox's Cunning, or Owl's Wisdom, as the spell. Mystic MissileN - Use Magic Missile, as the spell, and be able to launch a single missile as an Immediate Action. OmenN - Use Omen of Peril, as the spell, but without the need for a Focus. Scalding Dust4 - Use Gust of Wind as the spell; creatures in area take Fire damage equal to your caster level. Scorn EarthN - Glide above solid surfaces; become immune to caltrops, Grease, and other ground-based dangers, and fall slowly as Feather Fall. See the Unseen1, 4 - Gain See Invisibility, as the spell, and darkvision. Spiderwalk1 - Gain Spider Climb as the spell and you are immune to webs. Summon Swarm1 - Use Summon Swarm, as the spell. StormcloudN - Use Thunderhead, as the spell. TranspositionN - Use Baleful Transposition, as the spell. Wintry EmbraceN - Use Creeping Cold, as the spell, but without the need for a Focus. Words of Power, LeastN - Use Power Word: Fatigue, Power Word: Pain, or Power Word: Sicken, as the spells. Charm1, 4 - Cause a single creature to regard you as a friend. Curse1 (as Curse of Despair) - Curse one creature as the Bestow Curse spell, or hinder their attacks. The Dead Walk1 - Create undead as the Animate Dead spell. DefenestrationN - Use Defenestrating Sphere, as the spell. Dread Seizure3 - Halve a target's movement, and give it a -5 penalty on attacks against those more than 5 ft. away. Elemental OrbN - Use Orb of Acid, Orb of Cold, Orb of Electricity, Orb of Fire or Orb of Sound, as the spells. Energy Resistance4 - Gain resistance 10 to acid, cold, electricity, fire, or sonic damage. Enthralling Voice4 - Make nearby creatures fascinated. Flight4 (as Draconic Flight) - Sprout wings and fly at good maneuverability; fly longer overland. Falling DreamN - Use Illusory Pit, as the spell. Flee the Scene1 - Use short-range Dimension Door as the spell, and leave behind a major image. Frightful Presence4 - Make nearby creatures shaken. Harkon's BladeN - Use Sword of Deception, as the spell. Humanoid Shape4 - Take the form of any humanoid creature. Hungry Darkness1 - Create shadows filled with a swarm of bats. Ignore the Pyre3 - Gain resistance equal to your Caster Level to Acid, Cold, Electricity, Fire, or Sonic damage. Make WayN - Use Forcewave, as the spell. Relentless Dispelling2 - A targeted Dispel Magic, with additional targeted Dispel Magic the next turn. Stony Grasp1 - Use Stony Grasp as the spell. Voidsense1, 4 - Gain blindsense 30 feet. Voracious Dispelling1, 4 - Use Dispel Magic as the spell, causing damage to creatures whose effects are dispelled. Walk Unseen1, 4 - Use Invisibility (self only) as the spell. Wall of Gloom1 - Use Wall of Gloom as the spell. Witchwood Step2 - Walk on water and move through some obstacles unimpeded. Weighty Utterance3 - Flying target falls 5 ft. per Caster Level; takes falling damage if it hits a surface. Arcane Hide1 (as Draconic Toughness) - Gain temporary hit points equal to your caster level. Aura of Flame1 - Aura deals Fire damage to creatures that strike you. Baleful Geas1 - A single creature becomes your servant, but slowly sickens and dies. CallingN - Use Sending as the spell. Caustic Mire2 - Acidic sludge slows progress, deals damage. Chilling Fog1 - Create Solid Fog that deals Cold damage. Chilling Tentacles4 - Use Black Tentacles as the spell, and deal extra Cold damage to creatures in the area. Devour Magic4 - Use targeted Greater Dispel Magic with a touch and gain temporary hit points based on the level of spells successfully dispelled. Dragon Ward3 - Gain resistance to the attacks and special abilities of dragons. EhlnofexN - Use Bones of the Earth, as the spell. Enervating Shadow4 - Gain total concealment in dark areas and impose a Strength penalty on adjacent living creatures. FissureN - Create a temporary Wall of Stone, stagger and push aside those who are in its way. GlaciationN - Freeze target so they cannot move. Nightmares Made Real2 - Create illusory terrain that damages foes and allows you to hide. Painful Slumber of Ages2 - Creature falls asleep, takes damage when awakened. Pulse of Terror1 (as Terrifying Roar) - Use Fear as the spell; creatures shaken by the effect cannot attack you. Tenacious Plague4 - Use Insect Plague as the spell, but the summoned locust swarm deals damage as a magic weapon. Voodoo DollN - Immobile construct shares damage with target on death, has no defenses. Wall of Perilous Flame4 - Create a Wall of Fire as the spell, but half the damage from the wall results from supernatural power. Windstorm1 (as Wingstorm) - Create powerful gusts of wind. Words of Power, GreaterN - Use Power Word: Disable, Power Word: Distract, or Power Word: Nauseate, as the spells. Brewing StormN - Allies within cloud gain 1 AC per round, enemies within cloud lose 1 AC per round. Discorporation4 (as Dark Discorporation) - Gain many benefits of the Swarm subtype. Energy Immunity1 - Gain or grant immunity to Acid, Cold, Electricity, Fire, or Sonic damage. Flight, Greater4 (as Greater Draconic Flight) - Fly at perfect maneuverability; gain overland speed. Impenetrable Barrier3 - Use Wall of Force, as the spell, but it is perfectly black and blocks line of sight. Instill Vulnerability1 - Remove resistances and immunities. Polyscient1 (as Dark Foresight) - Use Foresight as the spell, and communicate telepathically with a close target of the effect. Master of PhysicsN - Use Telekinetic Sphere, as the spell. MeteoN - Use Meteor Swarm, as the spell. Path of Shadow1 - Use Shadow Walk as the spell and speed up natural healing. Perilous Veil1 - Use Veil as the spell; anyone succeeding on the Will save to negate the illusion takes damage. Retributive Invisibility1 - Use Greater Invisibility as the spell (self only) that deals damage in a burst if dispelled. Spellcaster's BaneN - You may attempt to counterspell an opponent as an Immediate Action, as if casting Greater Dispel Magic. Steal Summoning2 - Take control of another caster's summoned monster. Word of Changing1 - Use Baleful Polymorph as the spell, but the effect could become permanent. Words of Power, GreatestN - Use Power Word: Kill, Power Word: Petrify, or Power Word: Stun, as the spells. Void MagicN - Use Antimagic Field at range, but only as long as you concentrate. You can use Bear's EndurancePHB, Bull's StrengthPHB, and Cat's GracePHB, as the spells. Only one may be active at a time; using another, even on a different target, causes the previous effect to be removed. You can use Animate FireSC, Animate WaterSC, and Animate WoodSC, as the spells. You can use Local TremorRotD, as the spell. You can use Balancing LorecallSC, and Listening LorecallSC, as the spells. Only one of these may be active on your person at a time; using it again replaces any previous uses. You can use GreasePHB and Sticky FloorRotD, as the spells. You can use Eagle's SplendorPHB, Fox's CunningPHB, and Owl's WisdomPHB, as the spells. Only one may be active at a time; using another, even on a different target, causes the previous effect to be removed. You can use Magic MissilePHB, as the spell. Additionally, you may fire a single missile, as from the spell, as an Immediate Action. You can use Omen of PerilSC, as the spell, but you do not require any Focus with the invocation. You can float a foot above the ground. Instead of walking, you glide along, unconcerned with the hard earth or difficult terrain. While you remain within 1 foot of a flat surface of any solid or liquid, you can take normal actions and make normal attacks, and can move at her normal speed (you can even “run” at four times your normal speed or "jump" from your position 1 foot above a surface). However, you have no ability to maintain any altitude greater than 1 foot due to this invocation. You are also considered to be under the effects of Feather FallPHB, as the spell. You can use ThunderheadSC, as the spell. Casting this invocation twice on the same target doubles the duration, and continued casting continues to multiply the duration as normal for multiplier addition rules (i.e. double, then triple, then quadruple, etc.). You can use Baleful TranspositionSC, as the spell. You can use Creeping Cold, as the spell, but without any need for any focus. You can use Power Word: FatigueRotD, Power Word: PainRotD, and Power Word: SickenRotD, as the spells. You can use Defenestrating SphereSC, as the spell. You can use Orb of AcidSC, Orb of ColdSC, Orb of ElectricitySC, Orb of FireSC, and Orb of SoundSC, as the spells. You can use Sword of DeceptionSC, as the spell. You may only have one sword at a time; casting this invocation while a sword still exists eliminates that sword in favor of the new one. You can use ForcewaveSC, as the spell. You can use Power Word: DeafenRotD, Power Word: MaladroitRotD, and Power Word: WeakenRotD, as the spells. You can use Sending, as the spell. You can use Bones of the EarthSC, as the spell. You can use Illusory PitSC, as the spell, but it lasts only as long as you concentrate. You can create a 5 foot wide stone wall up to 10 feet high along a 60 foot line starting from your position. All creatures within the line take 1d6 bludgeoning/piercing damage per 2 levels (maximum 8d6 damage at 16th), are moved to the nearest square on the side of the wall of your choice, and are staggered, unless they make a Reflex save, which halves the damage, allows them to choose which side of the wall they wish to be on, and prevents the staggering. Squares adjacent to the wall are difficult terrain, and the wall lasts for 1 round plus 1 round per 5 levels. You can freeze a target solid for one round, such that they can take only mental actions, unless they make a Will save. A frozen target takes 1d6 Cold damage per 2 levels (maximum 8d6 at 16th); any target who takes no Cold damage due to resistance or immunity to Cold damage is also immune to being frozen. A target who was frozen is slowed, as by the spell SlowPHB, for two rounds after thawing out. You can use Power Word: DisableRotD, Power Word: DistractRotD, and Power Word: NauseateRotD, as the spells. You can create a voodoo doll of any target within 60 feet; the doll begins in any free square adjacent to you. The doll lasts one round per level, or until the target moves more than 60 feet from the doll. The doll may have up to 8 HP per caster level, but you lose HP equal to one quarter the HP given to the doll. If the doll is killed before the effect ends, the target takes damage equal to its full HP. If the effect ends without the Doll dying, you regain one quarter of the HP it had remaining. The doll is a construct, but does not have immunity to poison, necromancy effects, critical hits, nonlethal damage, or effects that require Fortitude saves, though all nonlethal damage dealt to the doll is treated as lethal damage. However, it is immune to any and all status effects, conditions, etc; only HP damage can be applied to it. It cannot be healed or repaired by any means. The doll has no actions and furthermore cannot be moved. The doll has an Armor Class of 0 (and is always treated as flat-footed), no Damage Reduction, no Spell Resistance, a Hardness of 0, and a +0 bonus to all saving throws. Any other defenses the target may have had do not apply to the doll. This invocation creates an ephemeral cloud at a Range of Medium (100 feet + 10 feet per caster level), and the cloud immediately spreads in a radius equal to Close range (25 feet + 5 feet per 2 caster levels). The cloud itself is short-lived - it is gone moments after casting, having no effect on the sight or movement of those within it. Those who were within it when cast, however, gain some of the cloud clinging to to their bodies, and this cloud effects them for one round per level. Each round, every creature that was within the cloud at the time it was cast either gains a +1 bonus to AC, or takes a -1 penalty to AC, chosen by you when you cast it. Any creature who does not want to accept these changes is entitled to a Will save each round to prevent that round's changes, though the DC for this save goes up by 1 for every consecutive save the creature has made previously; failing the save resets the DC to its usual value for the next round. No creature can be reduced below 10 AC, or below 10 touch AC or 10 AC when flat-footed (though a creature with 10 touch AC or 10 flat-footed AC continues to take penalties to its AC for other situations until all three values are 10). By the same token, this effect can no more than double a creature's AC; once this effect has added as much AC as the creature had without it, it simply maintains that much AC until it wears off. You can use Telekinetic Sphere, as the spell, except that you must always be within the sphere, and the sphere can only move you with respect to other objects within the sphere. Effectively, it needs to be touching something solid in order to maintain its height, and will otherwise fall, so it can only lift you into the air a distance equal to its own diameter. It can, however, move upwards with you if you have other means of flight, in which case it can move relative to you and more things with respect to you; you are, essentially, the solid surface against which everything else is being moved. You can use Meteor Swarm, as the spell. You may attempt to counterspell a spellcaster as an Immediate Action, as if you had cast Greater Dispel Magic. The spellcaster gains a +2 bonus on his opposed Caster Level check for every consecutive round you have successfully counterspelled him; this bonus reverts to +0 if you fail to counterspell him (either because you did not try or because he succeeded on the check). You can use Power Word: KillPHB, Power Word: PetrifyRotD, and Power Word: StunPHB, as the spells. You can use Antimagic Field, but with a Range of Close (25 ft. + 5 ft. per two caster levels), and with a Duration of Concentration. 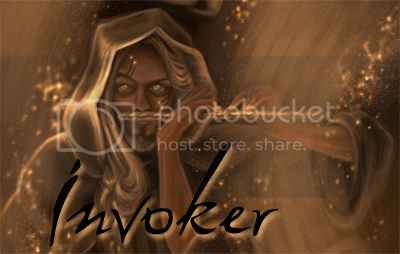 The image is slightly adapted from Invoker by ajinak. All credit to her for the image. I've been thinking about updating this with an ACF for the alchemy/scroll portions, since those were somewhat unpopular. I need to go through the old thread again to determine what I want to do, but I'd also like input on ideas for that. Wow, how have I not seen this class before? I really like it. I would love to try it out.